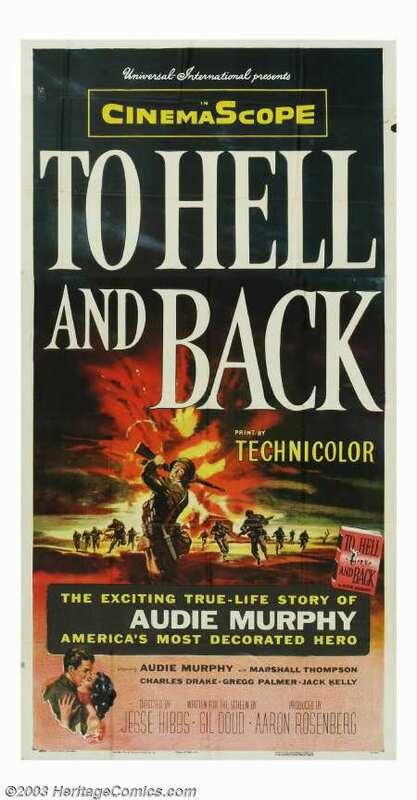 Click here for Audie Murphy's "To Hell and Back"
THE MOST DECORATED SOLDIER OF HIS TIME BECAME A HOLLYWOOD MOVIE STAR AND A "G.I. 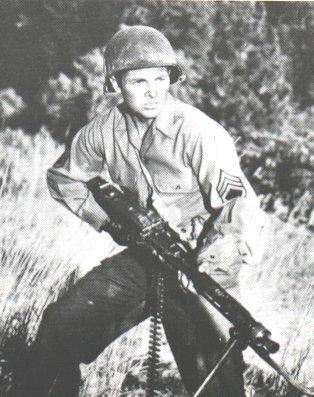 JOE"
Audie Murphy from Greenville, Texas, became one of the most decorated GIs of World War II AND a major motion picture star. He dropped out of school after the 5th grade and enlisted in the US Army at age 18 : Height, 5'5", Weight, 112 pounds. His unit was shipped to North Africa in early 1943, landing in Gela, Sicily, where Audie Murphy proved himself as a combat soldier. Corporal Murphy and his men then pushed through Italy. He was promoted again to staff-sergeant and his B company of the 1st Battalion of the 15th Infantry spearheaded the advance from the Anzio beachhead. By January 1944 he achieved the rank of Lieutenant. 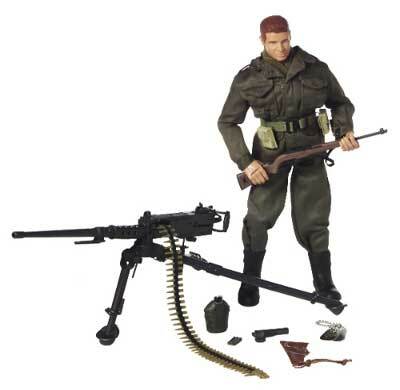 After the fall of Rome, Murphy and his group took part in 'Operation Anvil', the liberation of southern France, and spearheaded an attack along the Siegfied Line. In June 1945, Audie Murphy returned to Texas and was given a hero's welcome. He was awarded the Medal of Honour. His other decorations included the Distinguished Service Cross, the Silver Star, four Purple Hearts, a Bronze Star, and the European Theatre Medal with seven Battle Stars. In 1948 he was awarded the Cross of the Chevalier of the Legion of Honour in Paris. Hollywood beckoned and Audie Murphy soon starred in a series of westerns, characterized as a soft-spoken 'Shane'-like hero with an icey gaze and deadly fast draw. To most fans, Audie Murphy's most thrilling film role was playing himself in his autobiographical WWII motion picture "TO HELL AND BACK". 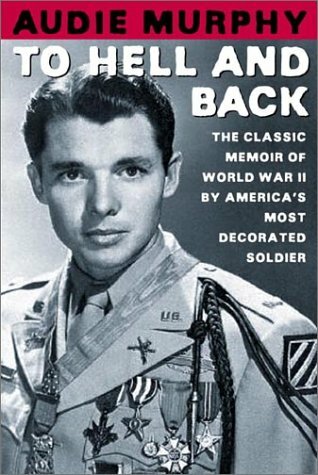 CLICK ON THE VIDEO FOR MORE "AUDIE MURPHY"
Click here for Audie Murphy's book "To Hell and Back"